For this aggressively arty documentary, Lucien Castaing-Taylor and Verena Paravel used tiny watertight cameras to record the sights and sounds of a fishing boat off the coast of New Bedford, Massachusetts. The footage they've collected is colorful, kinetic, and often disorienting; one lengthy shot captures the roiling water below and then, as the camera lens bounces around, a riot of seagulls in the sky overhead. Apart from a few brief, pedestrian comments from fishermen, the movie unfolds without interviews or narration, a barrage of sensory information—the hum of engines, the dead fish slopping around on deck, the immense power of the sea and rain. You may find this tedious, but you may also leave the theater tasting salt water. 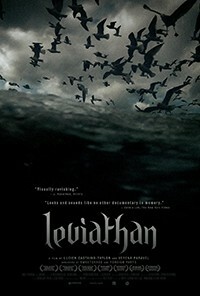 Leviathan, Leviathan, Leviathan and Leviathan are not showing in any theaters in the area.